First is this scene along our driveway. 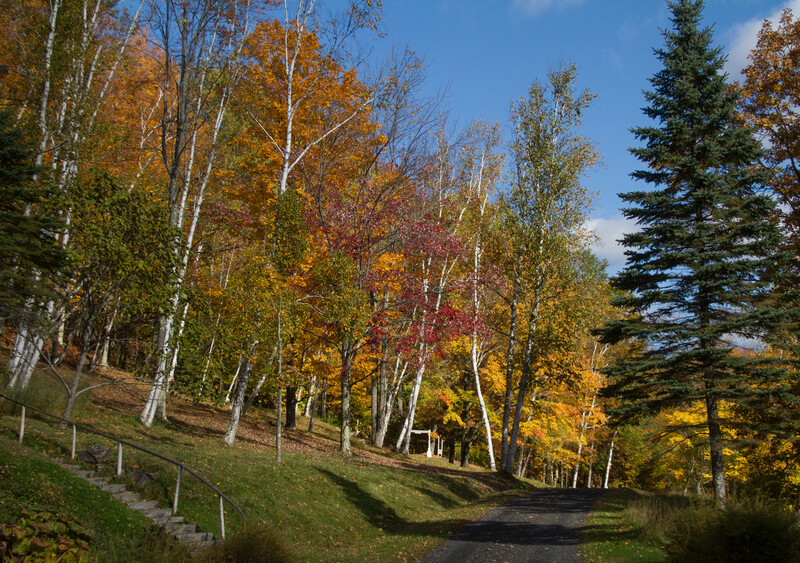 White birch trees stand out against colourful leaves. The white wooden doorway in the distance marks the entrance of the China Terrace, the re-imagining of the old resort hotel that once stood on the property. 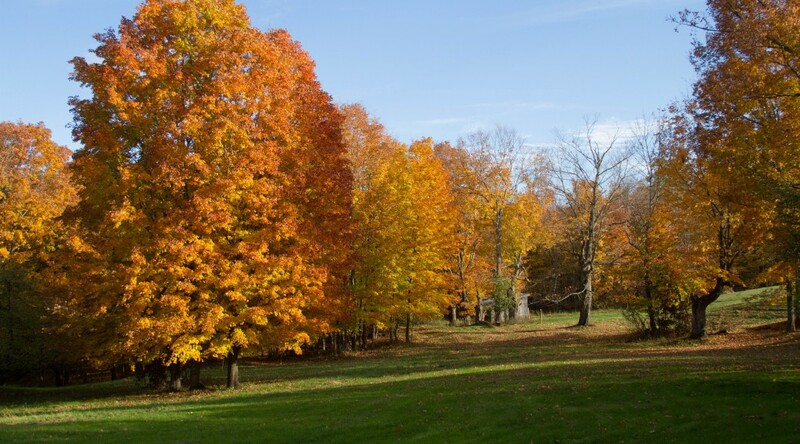 Nearby is this group of trees, resplendent in their brilliance. Maple leaves gleam in the sunlight, offering a sharp contrast to the slender tree that has lost its leaves. There’s a froth of colour at the Aqueduct. 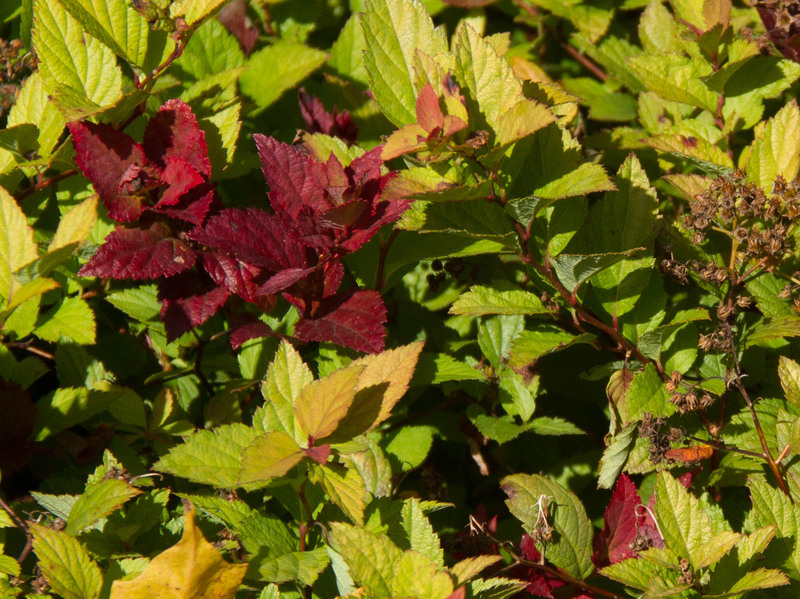 Beside it, this work horse spirea offers an unexpected touch of colour. 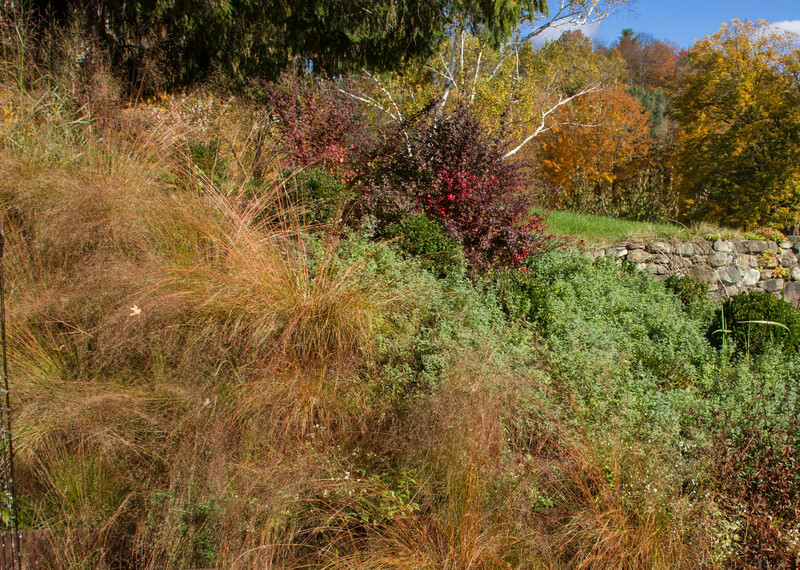 The reds, yellows and greens of Spirea japonica ‘Magic Carpet’ take us for an autumn ride. By the front door, our native witch hazel, with its twisted trunk, has an Asian look. 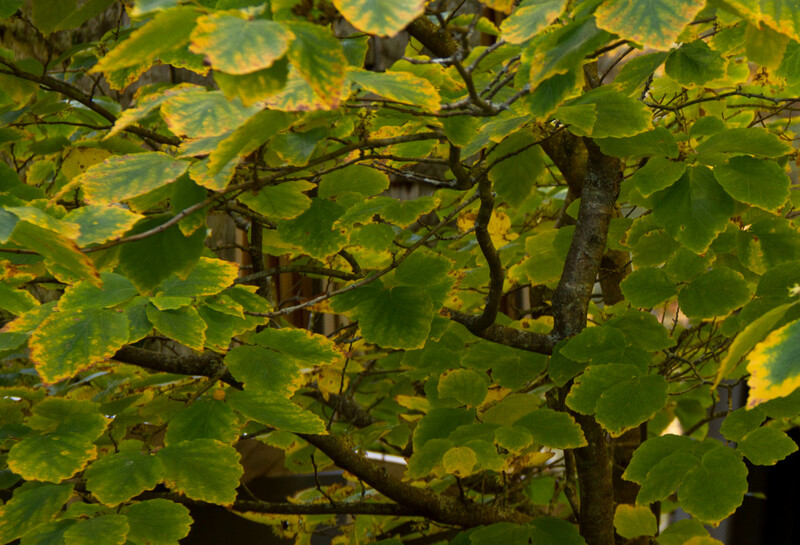 Soft tones of yellow and green adorn the witch hazel (Hamamelis virginiana). At its feet are bergenia. 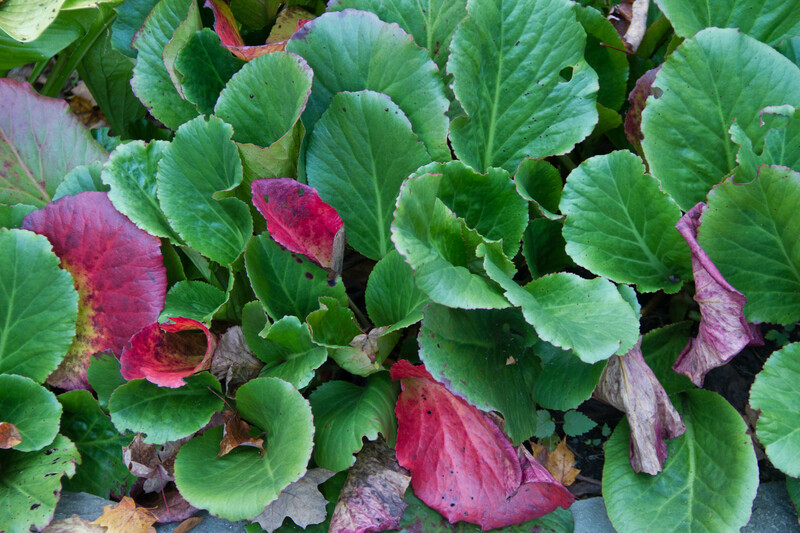 Bergenia leaves present themselves as Christmas colours, red and green. Change in the garden occured gradually. 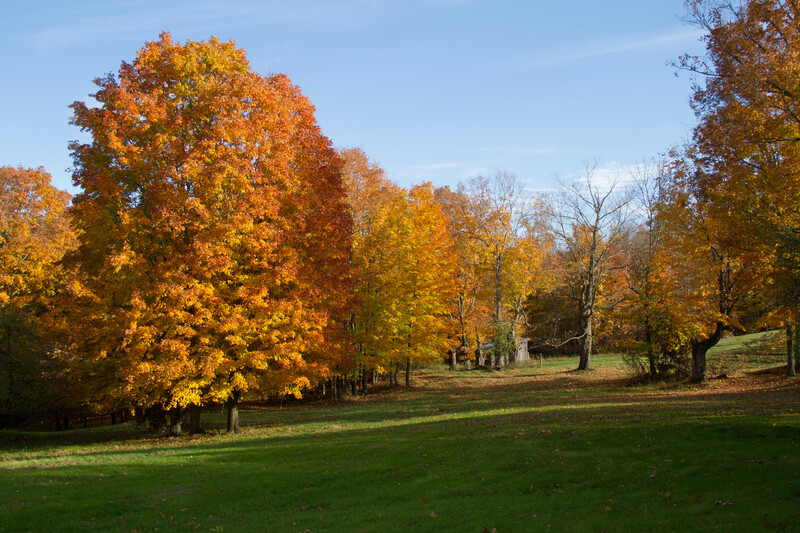 A few weeks ago, the trees had only begun to turn. 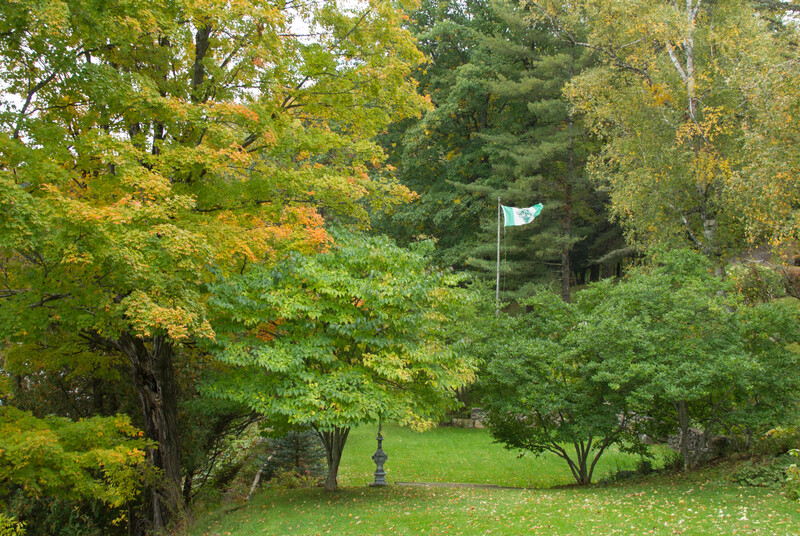 The Glen Villa flag flies proudly above the Lower Garden. Some things, though, never change — a turkey is always a turkey. 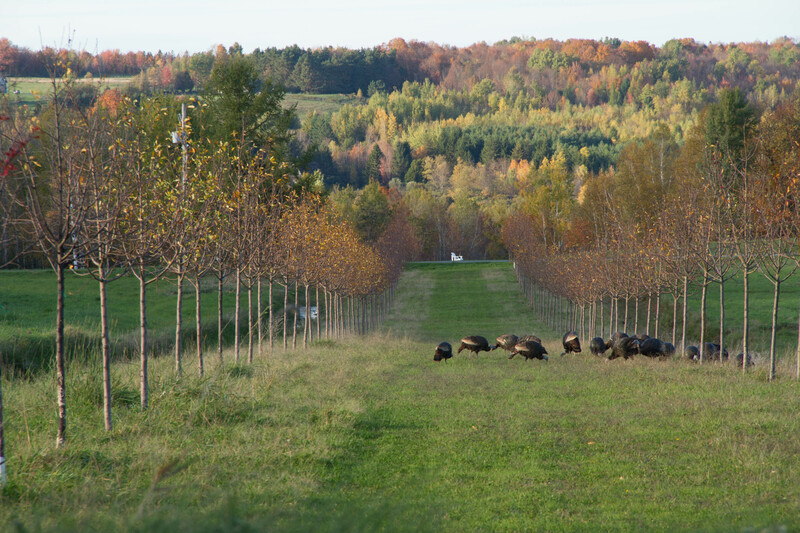 Wild turkeys enjoy strolling along the Crabapple Allée, munching as they go. A late Happy Thanksgiving to Canadian readers, and an early one to Americans. And to those who celebrate neither, Happy Fall. Looks like it is a good year for color and the leaves are holding! I trust permanent residency in the Hat will be most agreeable! 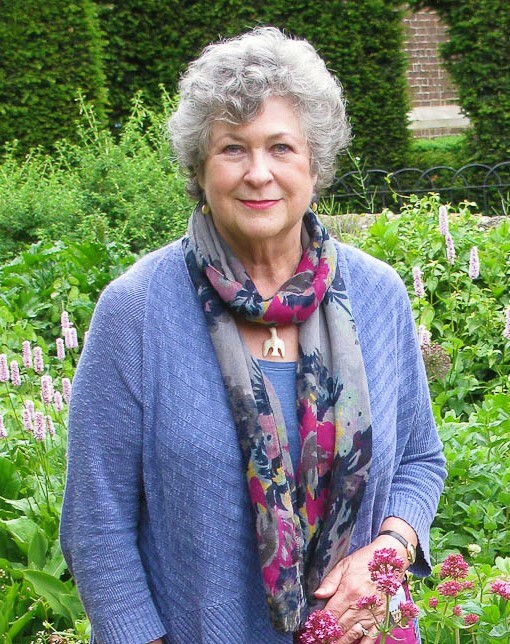 I’m thrilled that we will be there full time. Sadly, it was so warm here in September and October that the leaves didn’t change color much. Then we had almost 2 inches of rain, and many leaves fell before changing color. We’re supposed to get our first frost tonight and it looks like this year’s display is a dud. You’ve reminded me how colourful Bergenia can be at this time of year. Congratulations on weathering the sale and closing of your condo – and the move. These things can be bittersweet, but what a wonderland to spend your time in now! I was surprised by the strength of the red in the bergenia leaves. It seems deeper and clearer than in previous years. I’ll pay attention next year and do a comparison. Here too. Lots of great things no doubt resulting from the weather and not to be planned on recurring..! Glorious color! Autumn has been fairly subdued around here, at least so far. Sale completed today! So we are celebrating tonight… even in the pouring rain. And that puts an end to autumn colour.